As we've grown very used to as well much of the talk during the qualifying session, and the weekend more broadly, was about tyres. Reflecting this campaign's bring-three-compounds rule Pirelli as it often does brought an aggressive one, this time with the supersoft available in addition to the soft and medium we've had in previous Spa visits. 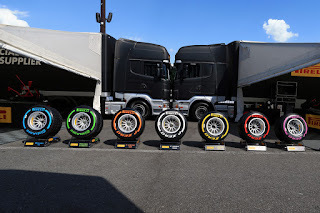 The trouble is though that this time this softest tyre is thought to be good for not much more than a lap (or perhaps even less than that), thanks to the high temperatures and a strict boundary on how low the tyre pressures can go. A limit that Felipe Massa for one described as "a bit of a joke". Lewis in a general sense described the supersoft as "terrible". 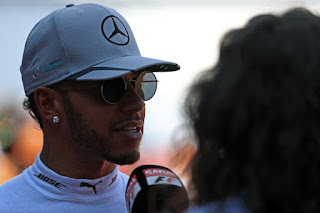 But in another thing that seemed rather familiar Nico Rosberg when presented with an open goal, as a result of his Mercedes team mate and habitual nemesis Lewis being removed from the picture in today's qualifying session, fired the ball into the net. And in that situation you can't really ask for more. Yet it wasn't quite all it appeared on the surface. From topping the opening Friday practice even with the halo bolted on in the subsequent sessions both Mercedes rather slipped down the order to modest places. Given what we're used to the suspicion lingered that Merc would find the pace it needed when it mattered, as it almost always does. It did this time again, but the team was genuinely worried. "We had a difficult weekend up to now, especially this morning" said Nico after bagging pole. "After FP3, we were still quite a way off the pace. But we managed to turn it around. "We made quite a few changes going into qualifying and we found the right way. It all came together and it was feeling good, so I'm very pleased about that one." Niki Lauda confirmed that the team's concern was real. "I was very worried", he said, "because nothing seemed to get together, Friday, Saturday, Saturday morning, and now we made it again thank God". He wasn't even sure what explained the difference. "I don't know" Lauda said when asked, "but it all happened, now we have to analyse why it happened". 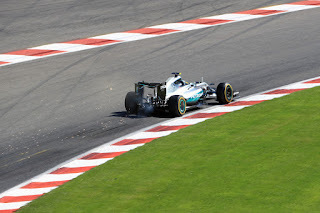 But prevail Merc and Nico did, and did it still with avoiding having to start on the dread supersoft tyres tomorrow. In another familiar tale it was in Q2 that Mercedes really appeared to put a stride on the rest. Nico did a fine 1m 46.999 lap to get through and did it on the 'slower' soft tyre, meaning he can start the race on them. In another thing that has happened before the Mercedes didn't however make anything like the laptime gain going onto the supersoft than others, as in Q3 Nico only shaved about a quarter second off his Q2 effort, to set 1m 46.744. But it proved enough. Only just though. 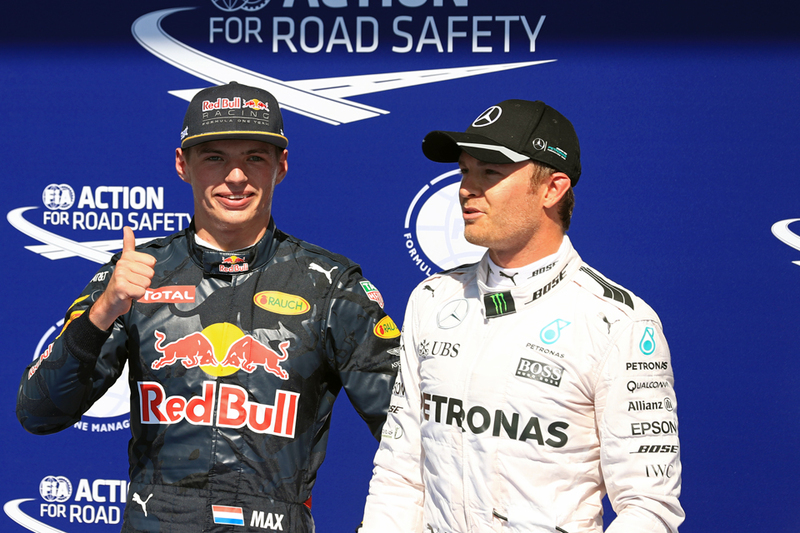 In setting the time he pipped an amazing mark set by Max Verstappen. At his pseudo home round (or perhaps not that pseudo, given he was born and raised in Belgium plus has a Belgian mother) Max had done a 1m 46.893 seconds before Nico got around to edge him. He was also another to have problems in advance this weekend, as he had to sit out most of Saturday morning practice with a gearbox problem, and some for a time feared a five-place grid drop. Not so though. Both Nico and Max after this had a run left but it was a little anti-climatic - perhaps appropriately so - as Max didn't improve (his boss Christian Horner thought the track was giving up less grip at that point) and Nico therefore, his pole safe, abandoned his lap. Max though starts second and in so doing became the sport's youngest front row starter, a record that had been untouched since 1961. "You can always do a better job" said Max later, "but I'm sure Nico could have also done a better lap. "To be so close to Mercedes on a track with long straights, we can be very pleased with that. "Especially in front of so many of my fans. It's great motivation when you see them on track." 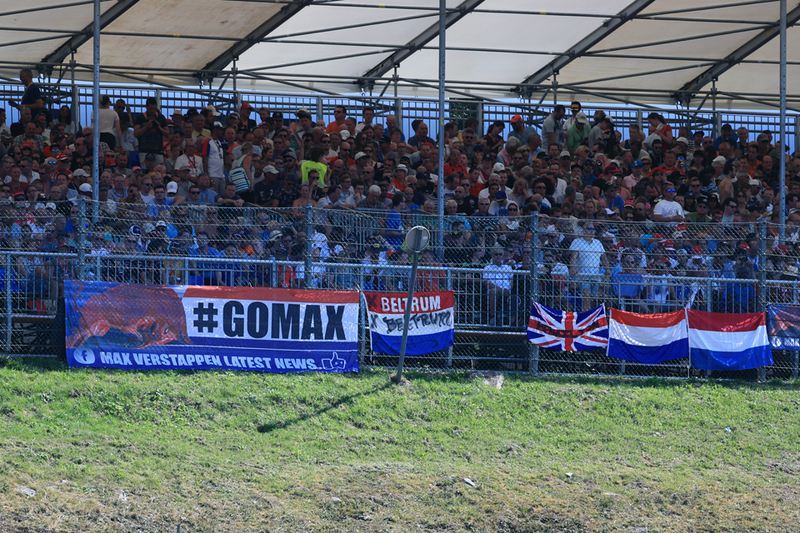 Horner too described Max's vital first Q3 effort as "stonking" and "very impressive". The only note of worry however is that unlike most of those near to him at the sharp end of the grid Max will indeed start the race on supersofts rather than the soft. 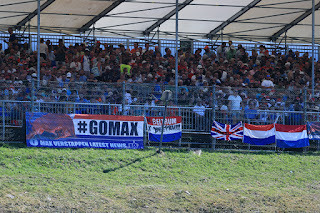 Both Max and Horner accepted they'll have to stop earlier than those on softs tomorrow, but still it might be premature to start writing Max obituaries for this weekend. In Austria for one the supersoft was meant to fall apart pronto in the opening race stint and didn't, some forecasts suggest tomorrow will be cooler (and indeed, typical Spa, that there might be rain around...) and Max is pretty good at looking after his tyres. Horner too thought that even with an early stop Max will be in a good place to attack from then on. "He should then be able to start making real progress through the field, maybe even have track position" Horner said of his young Dutch charge, "it's going to be fascinating to see how it really works out...it's not clear cut...both [Red Bull] drivers independently came up with the tyre choice that they've got here today". Max also was positive. "We think it's the best strategy to go into tomorrow, and we'll see how it pays off". 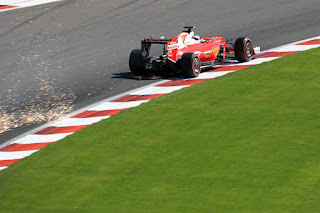 While all the other fun was going on Ferrari looked for a time that it might just be able to pick through the rubble of others' chaos to emerge on top, with Spa specialist Kimi Raikkonen looking particularly strong. But in another thing that will have a nagging ring of recognition about it is that the Scuderia didn't quite get it done when it mattered, then ended things both with regret and a little bit of acrimony. Kimi messed up his first Q3 run definitively by running off at Stavelot, and while his final run was good enough for P3 and was only a couple of tenths off the pole mark, the Finn reckoned there was more in there. "The second run was pretty good but comparing to my Q2 lap, I lost two tenths in the last chicane", he said, "I got understeer. Obviously pole position was there. We had a good chance." Perhaps so, but as noted Nico could have done another run if needed. "It would have been more easy not going off on the first run and have a decent lap but that is how it is" Kimi went on. "It's disappointing because we were close and it would have been nice to get it. "Compared to the previous few races, we can be satisfied with where we are with qualifying. But we are not in front so we cannot be too happy. "Tomorrow is the race and I think we have to be satisfied" Kimi concluded. His team mate Sebastian Vettel next up was less content though. He also got out of shape at the final chicane on his last run which lost him time, and he was heard getting irate about it on the radio, that his car had "zero rear". Come the TV interviews he as usual had regained some of his diplomacy, and was another being optimistic about the race. "I think we can win this race" Seb insisted. "It will be key to look after the tyres, we need to be smart with our strategy and go from there." Daniel Ricciardo starts next up, oddly subdued for once. There is a general acceptance that with the tyre factor tomorrow's race could be hard to predict. Even Lewis coming from the back and with a freer compound selection concurred. "We're all going to have massive degradation" he said, "we're all going to have two or three stops, I don't know who's going to be able to look after their tyres or not. We are all struggling to look after our tyres". And, he thought, it might impact on those like him in the pack especially, "It's not going to be a cool easy breezy day tomorrow where I'm just picking one by one off" he added. He at least has the company of his old buddy Fernando Alonso back there, who similar to Lewis picked up plenty of grid penalties of his own for this one, and after his McLaren lasted but a few corners in qualifying he added a few more which means Lewis in fact gains a place already for tomorrow. But despite his frustration Fernando can look ahead with some optimism, as Jenson Button put his McLaren machine into a ninth place starting slot. And Jenson was correct to point out too that this is at a track about the worst for the McLaren (or more to the point, the Honda) on paper. There does seem to be progress at Woking in other words. That one also was once familiar. And might yet become so again.